Doesn’t a fruit salad look twice as delicious when it has slices of kiwi in it? This fruit not only has a unique flavor and visual appeal, but also has a high nutritious value. Some of the health benefits of kiwi include increased immunity, smooth digestion, and decreased blood pressure. The kiwi fruit is quite popular across the globe. There are two types of kiwis, named after their places of origin, California and New Zealand. Here are four amazing health benefits of kiwi that will surely make you include the fruit in your diet more than you normally do. Kiwis are considered highly effective in increasing the levels of good cholesterol in the bloodstream. Good cholesterol or HDL helps in decreasing the accumulation of excess fat in the arteries, and transports it to the liver, where it is metabolized. An increase in HDL levels is one of the health benefits of kiwi. Researchers at the Institute Of Nutrition And Health Science, Taiwan, conducted a study to determine the effectiveness of this fruit on cholesterol levels. The participants of the study were required to consume 2 kiwis everyday for 2 months. Although this fruit did not alter the levels of bad cholesterol, it helped in increasing good cholesterol levels (HDL). Kiwis also contain good amounts of fiber, which offers a number of health benefits. Fiber helps in slowing down the process of digestion and keeping abnormally frequent hunger at bay, and it regulates the body weight in this way. In addition to that, fiber also streamlines the functioning of the bowels, regulates blood sugar levels, and decreases cholesterol. Factors such as gender and age play a major role in determining your daily recommended fiber intake. A general rule of thumb is that men over 18 years of age should consume 30-38 grams of fiber a day, while adult women should consume 21-25 grams of this nutrient each day. A single cup of kiwifruit provides around 5.5 grams of fiber. The kiwifruit is a good source of potassium, a mineral that helps in regulating blood pressure. By raising the amount of potassium in your diet, you’ll be able to counter the negative effects of sodium, in terms of blood pressure levels. The American Heart Association has stated that people should consume 4700 mg of potassium in its natural form, to regulate their blood pressure in a healthy way. A single cup of kiwifruit possesses around 562 mg of potassium. You should speak to your doctor regarding your requirements of potassium, as certain ailments such as kidney disease, require the patient to consume low amounts of this mineral in their diet. 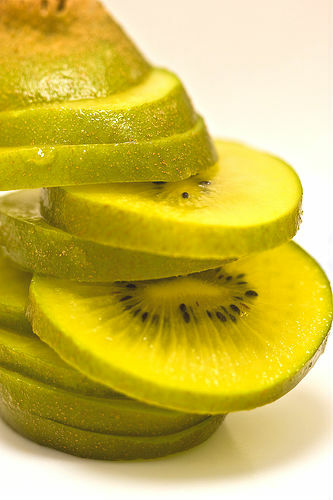 Kiwi contains high amounts of vitamin C, which is a water-soluble vitamin. This vitamin helps in the synthesis of collagen and regulates the overall growth of the body. 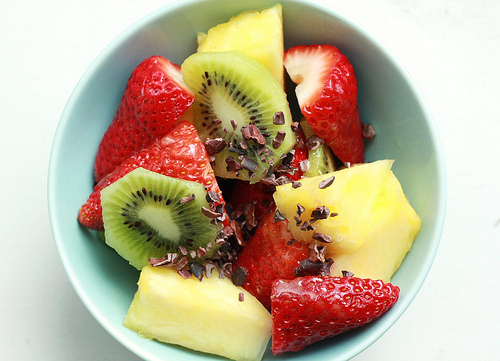 Get kiwi benefits like protection from heart disease and cancer by adding it to a fruit salad. Apart from that, vitamin C is also an antioxidant, which means that it helps in controlling the activity of free radicals, in turn reducing the risk of heart disease and certain forms of cancer. Now that you’ve read about the wonderful health benefits of kiwi, we’re sure that this fruit appears more tempting to you. Take advantage of its appeal and make it a point to include the kiwifruit in your diet, and you’ll see the benefits of kiwi for yourself! This entry was posted in Nutrition and tagged benefits of kiwi fruit, kiwi benefits by Zipheal Editorial Staff. Bookmark the permalink.